The Pisces Foundation is working to advance strategic solutions to natural resource challenges and prepare the next generation by supporting environmental education. Pisces believes if we act now and boldly, we can quickly accelerate to a world where people and nature thrive together. Pisces mainstreams powerful new solutions to support innovators who know what it takes and are doing what’s necessary to have clean and abundant water, a safe climate, and kids with the environmental know-how to create a sustainable world. I asked Jason Morris, Environmental Education Senior Program Officer at the Pisces Foundation, to share his thoughts on where the movement to connect kids with the outdoors is heading. The Pisces Foundation is a new supporter of OAK and we’re honored by their commitment to the field. Enjoy the interview here. Jason, why don’t you tell us a little bit about your own interest in environmental education. Why is this field important to you personally? For me, like many in the environmental education field, nature has shaped who I am and what I do. When I was 12 years old, I lived for the summer. I would fish in the canal by my house, care for the animals on my family’s farm, and explore the wonders of the natural world as often as I could. I remember one of my first camping trips into Rocky Mountain National Park. It was right after the first snowfall of the year. My family stumbled upon a huge meadow, where it seemed like every elk in the entire world had gathered. I was mesmerized. I stood there and stared as they grazed and mingled. For a moment, I felt like part of the herd. I was completely struck by an overwhelming feeling—awe. This story, among thousands of other experiences I’ve had in nature throughout my life, stands out to me. I share this story because feeling awe, even for a moment, can truly shake the foundation of what we believe. As a kid, I yearned to be in nature as often as possible. Growing up, I always hoped to experience the natural world, at home, at work, and at play. I have made it my life’s work to ensure that more people, at all ages, get to experience the benefits of nature—and not just in the summer! Tell us about the hopes and dreams the Pisces Foundation has for environmental education? At Pisces Foundation, we believe that when kids gain the environmental know-how they need to thrive in a rapidly changing world, we’ll see smarter decisions, stronger communities, and daily actions that improve their well-being and our planet. Environmental education is a proven way to get kids more engaged in learning and active and healthy outdoors. We see that more and more schools, states, and communities are tapping into the many benefits that come with environmental education and making it a part of every child’s experience. 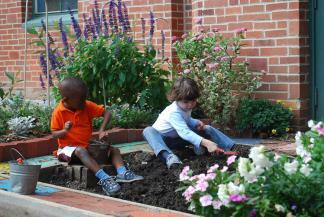 Our hope is that every child receives the benefits of environmental education. Environmental education is not a one-time event. It’s a series of life experiences that allow children to grow into adults who embrace responsible behaviors in order to make smarter decisions about the world. 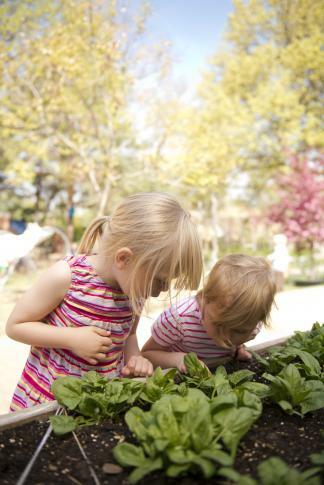 Research has shown that the benefits of environmental education can be immediate and long-lasting. With so many pressing environmental challenges, like climate change, why is it also important for environmental organizations and the philanthropy community to invest in environmental education and getting kids outdoors? I’m glad you asked this question, because it’s important to think of environmental education as an immediate investment as well as an investment in our future. Environmental education leads to gains in conservation, education, health and wellness, social justice, and youth development. Many of these benefits improve our communities and our planet today. And, kids who experience environmental education can grow up to be responsible, well-prepared citizens, ready to make the choices and decisions necessary to solve the pressing environmental challenges of tomorrow. We know that the sooner we act, the sooner we see the benefits. Solving environmental challenges and investing in environmental education are not an “either-or” division. They are important “both/and” investments that mutually reinforce one another. Both are integral components to get to the point where people and nature can thrive together. 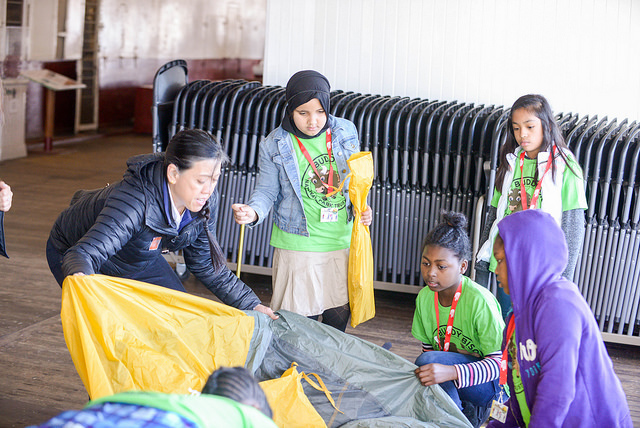 On behalf of the Outdoors Alliance for Kids, I cannot thank you and the Pisces Foundation enough for investing in our mission to advocate for equitable and readily available opportunities for children, youth and families to connect with the outdoors. As we enter our first year of collaboration with Pisces, do you have any advice for OAK and our alliance member organizations on how we can work together to expand and improve not just access, but equity in access, to the outdoors and outdoor learning opportunities for children and youth? 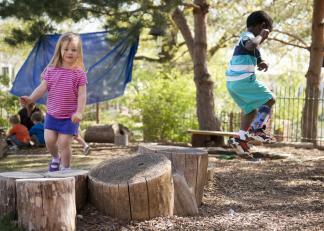 Research has shown that environmental learning levels the playing field, across gender and ethnicity. We know that outdoor experiences improve children’s self-esteem, leadership, and character. 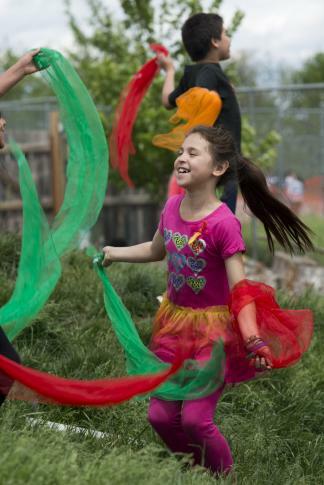 We know that unstructured play outdoors improves mental and physical health. We know that environmental learning sticks with kids more than traditional learning, that it stokes interest in science, and that it sparks the curiosity that makes kids better learners. We know all of this, yet the average American child spends 4 to 7 minutes a day in unstructured play outdoors, and over 7 hours a day in front of a screen. What we need is to connect children with nature. Not just some children—all children. Every child not only deserves access to nature, every child requires it. In order to deliver this to every child, we can no longer imagine nature only in the iconic treasured landscapes. To give every child the opportunity to form a lasting connection with nature, we must find nature nearby. We have to re-imagine what and where nature is. Through environmental education, we can give all kids the opportunity to experience the world that left me awe-struck as a 12-year-old. Whether it’s in a meadow watching a herd of elk, or in a city park staring up at a big oak tree, or in their own backyard discovering the joy of nearby nature, environmental education delivers. How did you get outdoors with your family this summer? My wife, daughter, and I spent an amazing week along the Metolius River in eastern Oregon. Surrounded by millions of acres of wilderness, we wandered along the banks of the river, canoed across a stunning mountain lake, and biked through the sun-drenched massive pine forest. A perfect opportunity to boost our spirit and nourish our passion for wild places. Nicole is an incoming 4th grader at Harmony Hills Elementary School in Montgomery County, Maryland. Interviewer, Isabel Argoti, introduced Nicole and her family to the Every Kid in a Park program and they are excited to participate in the program this school year. Nicole shares with us her excitement about the outdoors and her sentiments about the program. Nicole: My name is Nicole. I’m 9 years old and will be attending Harmony Hills Elementary School. What do you love about the outdoors and nature? What do you like to do outdoors? Nicole: I like all the colorful plants that are around me and how beautiful nature is. I like to take a short walk with my dogs and playing basketball with my mom when we have free time. Have you visited Rock Creek Park or some of the other national parks or monuments around Washington D.C.? If so, what did you like about them? Nicole: I went to the Martin Luther King Jr. monument it was so cool because it was my first time seeing it. Well did you know that with your Every Kid in a Park pass you could visit these sites plus hundreds of others, with your Every Kid in a Park pass for free this upcoming school year? How does that make you feel? Nicole: Excited and happy because I get to see and experience a place I’ve never seen or been to. That’s great! Who do you think you will go visit these parks with? Nicole: I will be visiting with my family –parents and sisters. What does being in the outdoors and enjoying nature mean to you? Nicole: Hanging out with my family and friends. It’s a break and escape from what we usually have to do. Do you think all kids your age should receive this pass to visit national parks? Why or why not? Nicole: Yes because everyone needs to know about nature and learn more about it. I also think they should know about the program [because] some kids are always on their phones, video games, and TV. I totally agree, Nicole! Any last comments or anything you’d like to say about the program? Nicole: Yes, in my opinion I think the government should support the park [and program]. It helps other kids to learn more about nature. I also think that the government should give more money to the park to keep them clean, nice, and beautiful. And also to have lights everywhere so people can go to the park until night time! Nicole attends a Title I school where over 80% of the students participate in the Free and Reduced Meals (FARMs) program, over 40% of the students are English for Speakers of Other Languages (ESOL) learners, and 90% of the students are either Hispanic or black. Nicole and her family have never visited large national parks before, but they hope to do so now with Nicole’s new Every Kid in a Park pass. Nicole is a first generation student in the United States and her family is originally from Ecuador. Celebrating “Every Kid in a Park” granting free National Park Passes to all 4th graders nationwide! 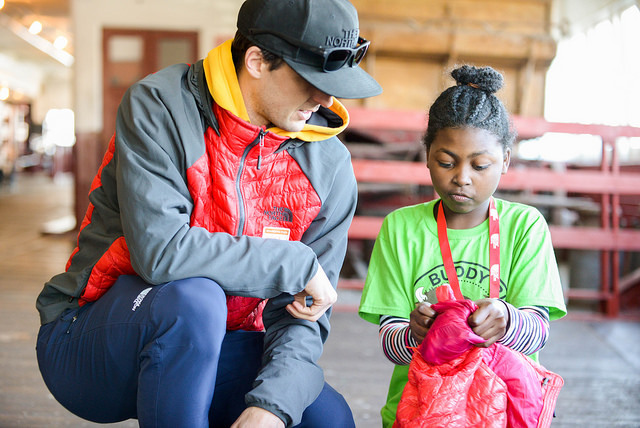 The super-tall, super-lean, super-endurance runner Dylan Bowman is bent over a bunch of outdoor gear – warm jacket, rain layer, etc – rolling up each item as tightly as possible and stuffing them into a backpack, demonstrating to a group of wide-eyed 4th graders how to pack a backpack for a day hike. He leans in and asks this small group of eight or so kids from Hoover Elementary School in Oakland, California: how many of you have ever gone hiking? Two of the eight kids raise their hands. Just two. North Face global athlete Dylan Bowman teaching about packing a backpack. I don’t know why I find that number surprising. I suppose it’s because I live and breathe the outdoors and I’m surrounded by like minded enthusiasts both in my community and online. But once I reach out of my comfort-bubble-zone, I remember the stark reality that most kids in the United States don’t have my kind of access to the outdoors and don’t get to go to parks beyond their local, neighborhood park. 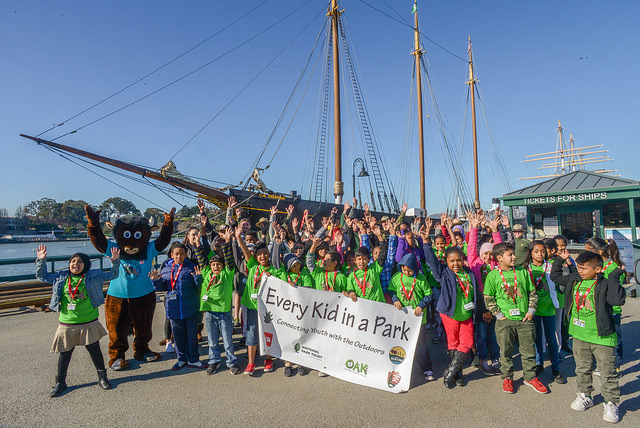 That’s why last week’s event at the San Francisco Maritime National Historic Park, which brought together 60 students from Oakland to enjoy a day of outdoor games and exploring and was sponsored by a powerful partnership of outdoor-kid-evangelist players, is so vital and touching. The official 4th Grade Pass to all U.S. National Parks. Each and every one of these 60 – 4th graders was proudly given a National Parks Pass to hang around their necks, as if receiving an Olympic Medal, for their entire family to have free access to all of America’s public lands and waters for the entire year, an initiative funded by “Every Kid in a Park” which launched out of the White House last year. 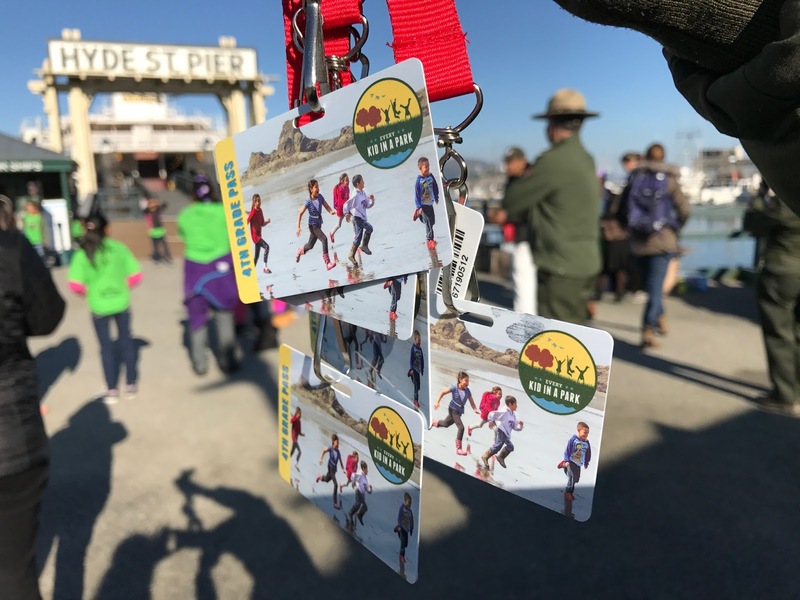 And to support and celebrate that initiative, The North Face Explore Fund, The Outdoors Alliance for Kids, The National Park Service and The National Park Trust have all banded together to create this event and similar events around the nation. Teaching a group of eager 4th graders how to set up a tent. “Too few children have opportunities to explore and enjoy the natural world and programs like this are critical to ensuring all kids can visit their public lands,” explains OAK Co-Founder and Chair, Jackie Ostfeld. And she’s right. By providing free access to our nation’s great and treasured parks, this initiative helps alleviate a piece of one the barriers, a financial one, and allows more families to play in the outdoors which in turn brings about a healthier, more active population overall. Senior Director of Outdoor Exploration at The North Face, Ann Krcik aptly adds, “through the Explore Fund grants, we are building a community of outdoor explorers and inspiring people to love and protect the places where we play.” This is key. This is vital. By introducing this giant population of 4th graders and their families to the Parks every year, we are creating stewards for wild places and green spaces for generations to come. North Face athletes mixing it up in the backpack relay race with some giddy 4th graders. So now we circle back to our super-athlete Dylan Bowman and this diverse group of wide-eyed kids hanging onto his every word. 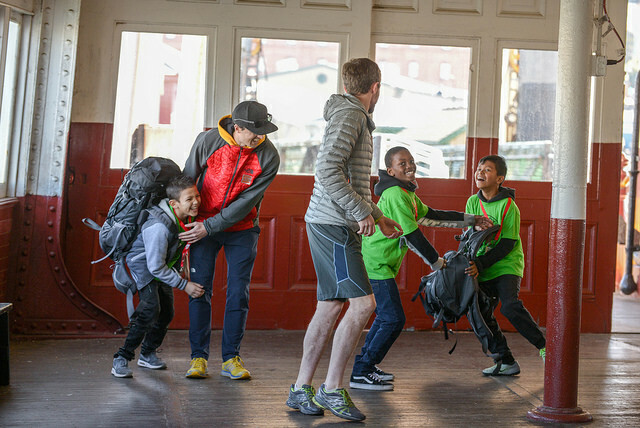 The “backpack relay race” starts and each kid is gleefully rolling up gear and smashing it into the backpack as fast as possible to beat the other team of classmates next to them, racing back and forth, gear and bodies flying everywhere. It’s this kind of giddy joy that helps tells the story of why getting these kids access to the outdoors is so important and why so many groups are making this their mission. Let’s all grab our backpacks and jump on board. To the summit! For more conversation about the outdoors find me on twitter, facebook and instagram. Every parent who has ever watched a child play in nature has cause to rejoice. NWF’s guide Nature Play & Learning Places: Creating and Managing Places Where Children Engage with Nature shows how to design and manage nature play areas and bring them to children in every community. 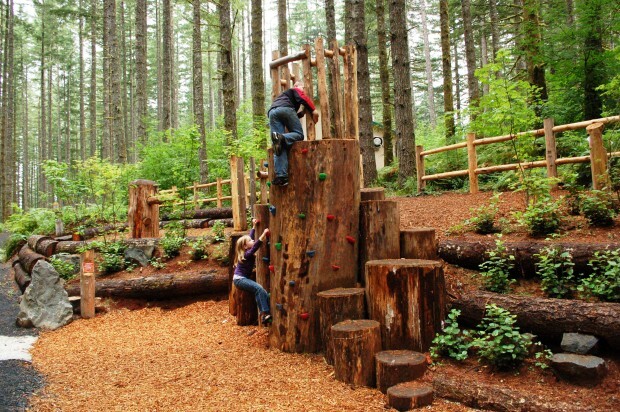 Nature Play & Learning Places is a project of the National Wildlife Federation and the Natural Learning Initiative at the College of Design, North Carolina State University. 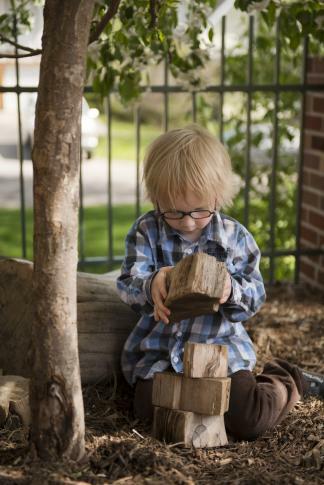 The guidelines draw from principal author Robin Moore’s extensive landscape design experience, case studies of 12 existing nature play areas across the country, and the contributions from the members of a national steering committee and a technical advisory committee, which consisted of representatives from more than 20 national organizations. For a free download of the guide visit http://online.nwf.org/natureplayandlearning.